America's Cup 2017: Team New Zealand, Glenn Ashby: "We are Ready"
Photo: ACEA / Ricardo Pinto - Video: sent by Emirates Team New Zealand. Glenn Ashby is Ready , the guy extrudes confidence as few others and no matter in which situation: Racing solo in the A-Cats, even under speed handicap, or sailing along top notch helm Peter Burling and the entire Commando Task force of Emirates Team New Zealand. Special Cup for the Kiwis on their lone trainings back in Auckland plus all the innovative developments they always bring to the Cup. We like Artemis and we cheer for New Zealand too, both with great chances to challenge Oracle in the AC Finals. 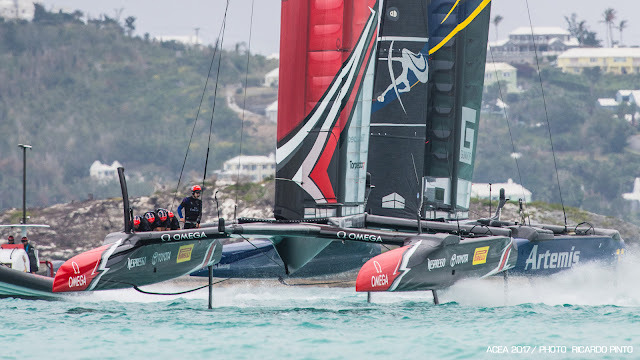 On the A-Cat / C-Class no jib style by TNZ, above practice racing vs Artemis, remember Oracle Tri vs Alinghi back in 2010. In the breeze the Wing alone (brought to the America´s Cup by New Zealander Design & Engineer guru Mike Drummond) might be more than enough. On Mike Drummond check his Excel Obscura blog, where you can download a custom tracking app implemented in Excel by him: excelobscura.blogspot.com/2017/04/americas-cup-realtime-viewer.html - We'll try with Mike to stream his tracking screen for those not able to watch stream or even follow tracking app. More on this later. The tracking, with plenty of data is public and based on Live data provided by ACEA.